CAN (Controller Area Network) is a serial communication line for real time application. It is an on-vehicle multiplex communication line with high data communication speed and excellent error detection ability. Many electronic control units are equipped onto a vehicle, and each control unit shares information and links with other control units during operation (not independent). 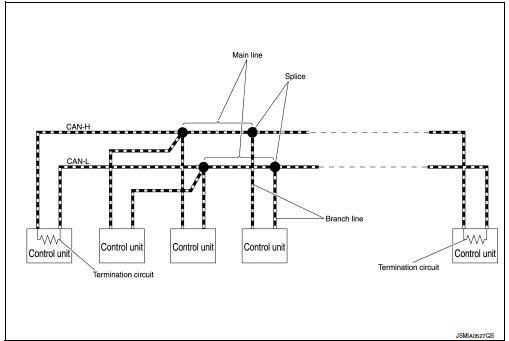 In CAN communication, control units are connected with 2 communication lines (CAN-H line, CAN-L line) allowing a high rate of information transmission with less wiring. вЂњDiag on CANвЂќ is a diagnosis method which uses the CAN communication line for the communication between the control unit and the diagnostic tool. DTC (e.g. U1000 and U1001) of CAN communication is indicated on SELF-DIAG RESULTS on CONSULT if a CAN communication signal is not transmitted or received between units for 2 seconds or more. Fuse blown out (removed): can communication of the unit may cease. Voltage drop: Error may be detected if voltage drops due to discharged battery when turning the ignition switch ON (Depending on the control unit which carries out CAN communication). Error may be detected if the power supply circuit of the control unit, which carries out can communication, malfunctions (depending on the control unit which carries out can communication). Error may be detected if reprogramming is not completed normally. Can communication system is normal if dtc of can communication is indicated on self-diag results of consult under the above conditions. Erase the memory of the self-diagnosis of each control unit. In CAN communication system, multiple control units mutually transmit and receive signals. Each control unit cannot transmit and receive signals if any error occurs on CAN communication line. Under this condition, multiple control units related to the root cause malfunction or go into fail-safe mode. 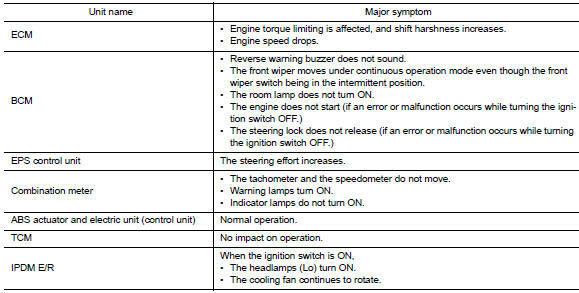 Each vehicle differs in symptom of each control unit under fail-safe mode and can communication line wiring. 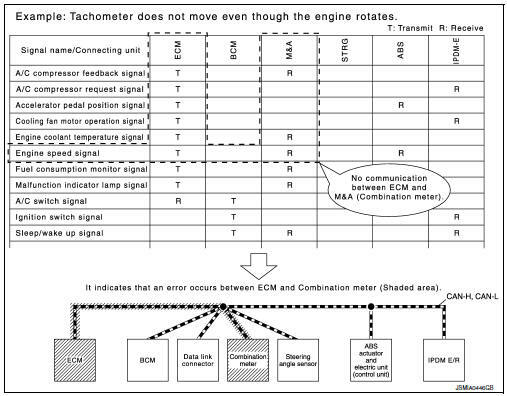 ECM Engine torque limiting is affected, and shift harshness increases. Reverse warning buzzer does not sound. The front wiper moves under continuous operation mode even though the front wiper switch being in the intermittent position. Eps control unit The steering effort increases. The shift position indicator and od off indicator turn off. Abs actuator and electric unit (control unit) Normal operation. Tcm No impact on operation. The headlamps (lo) turn on. The cooling fan continues to rotate. BCM Reverse warning buzzer does not sound. Eps control unit Normal operation. Shift position indicator and o/d off indicator turn off. 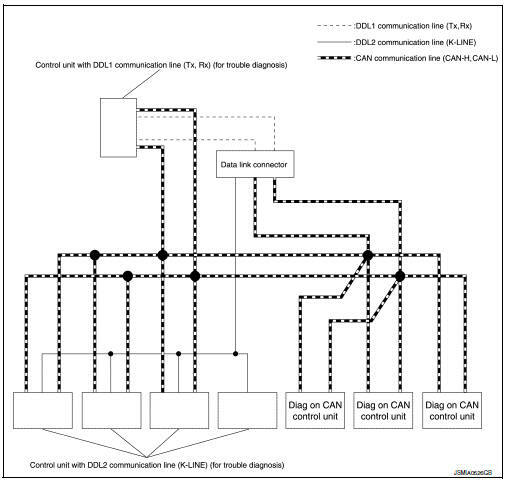 The model (all control units on CAN communication system are Diag on CAN) cannot perform CAN diagnosis with CONSULT if the following error occurs. The error is judged by the symptom. Data link connector branch line open circuit Normal operation. Can-h, can-l harness short-circuit Most of the control units which are connected to the can communication system enter fail-safe mode or are deactivated. When data link connector branch line is open, transmission and reception of CAN communication signals are not affected. Therefore, no symptoms occur. However, be sure to repair malfunctioning circuit. Can diagnosis on consult extracts the root cause by receiving the following information. If communication signals cannot be transmitted or received among control units communicating via CAN communication line, CAN communication-related DTC is displayed on the CONSULT вЂњSelf Diagnostic ResultвЂќ screen. The following table shows examples of CAN communication-related DTC. For other DTC, refer to the applicable sections. The can communication signal chart lists the signals transmitted/received among control units. It is useful for detecting the root cause by finding a signal related to the symptom, and by checking transmission and reception unit.